A Family can contain as many contacts as needed and is not limited to parents. Additional contact types can be added using Tools > Edit Settings > Drop-down Lists > Contact Types. Add additional contacts to a family by using the Add Contact button located on the Family's Page. By default, the first contact added becomes the Billing Contact. The Billing Contact is used when sending statements. Change the Billing Contact by selecting Billing Contact = Yes or Billing Contact = No as applicable and Save Changes. Additional information that can be entered on a Contact's page includes employer details, driver's license #, birth month & day, social security #, address, and phone numbers, etc. Changing a Family Address (on the Family Summary page) does NOT change a contact's address on the Contact's page. Changes to the contact's address must be done from the Contact page itself. 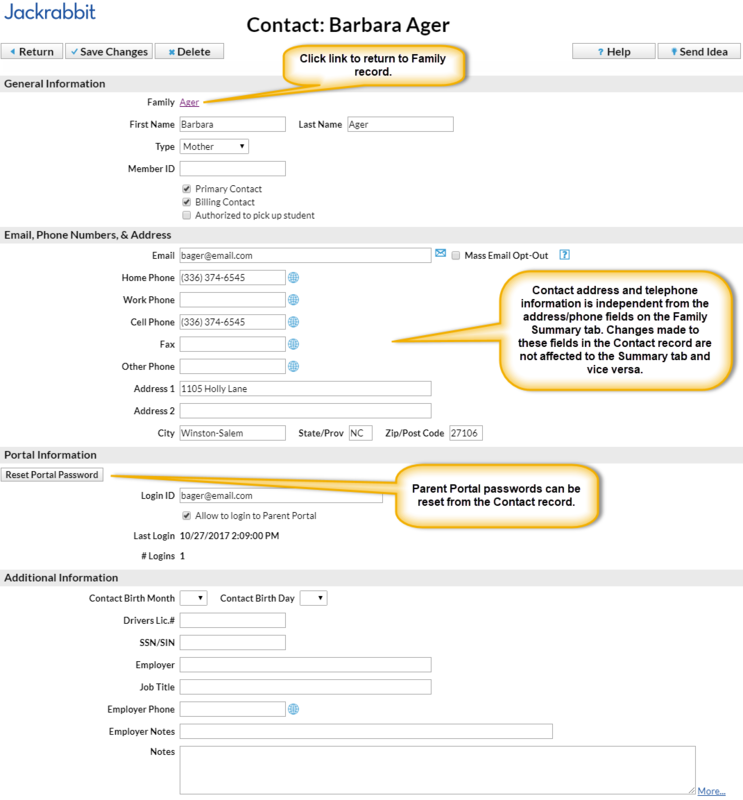 Changing a Contact's Address does NOT change a family's address on the Family Summary tab. Changes to the family's address must be done on the Family's Summary tab.